But, what looked like a late harvest for 2019 caught everybody off guard and it came earlier than usual. This off course narrowed the window for this traditional harvest bread most often made with the fermenting Sauvignon Blanc must. Sauvignon Blanc delivers on the most favourable aroma and taste to make this quintessentially South African harvest bread. Must has been a popular ingredient in cooking for centuries and it is believed that the French Huguenots established this tradition in the Cape. And nothing goes to waste. Apart from the warm, fuzzy feeling you get when butter soaks into a freshly baked Mosbolletjie, you can satisfy that same longing by dunking a Mosbolletjie rusk into your afternoon tea. Well, that’s what my gran told me when the season was over. So if you want to try it – you better get your hands on it now. It is absolutely delicious and easy to make. I can’t say that this is my gran’s recipe, but it was jotted down in one of my “have to remember” notebooks as a journalist whilst visiting a wine farm years ago. 6 cups (1.5 liters) fermenting must. Sift the cake flour into the liquid and stir thoroughly until it forms a smooth paste. It is important that the must is at the right balling (sugar content) and the winery where you collect it from will assist. Sift the flour, salt, sugar and aniseed together in a bowl. Make a well in the center and pour the yeast in the middle. My gran would always involve me here so if there is a little human in your kitchen, let him or her sprinkle a little flour over the top before you leave it to rise in a warm place. Preheat your oven at 200 ˚C. After about an hour, mix your butter and milk and whisk in the eggs. Add this to your flour mixture. Knead until it forms firm dough. Divide your dough into balls and pack closely together in greased pans. Let it rise until doubled in size, brush milk over the top and bake for an hour. When done, give it time to cool down a bit before turning it out. Make sure you serve it warm. Alternatively, cool down completely, break apart and arrange it on a baking tray. To form the rusks you need to lower your oven temperature to about 70 C so that your rusks can dry out properly. Serve the fresh mosbolletjies with Benguela Cove Noble Late Sauvignon Blanc 2015 or if you have homemade strawberry jam, pour a glass of the Lighthouse Rosé. 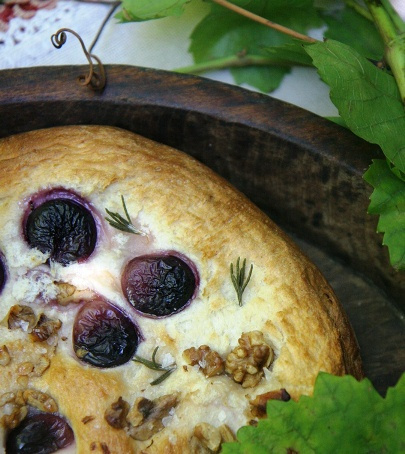 In the harvest spirit and celebrating the grape, I have to recommend a go-to recipe from my food mentor Errieda Du Toit – writer, director and collector of many cookbooks. Before you start, pop a bottle of the Cuvee58 MCC made from Sauvignon Blanc. Preheat the oven to 200 ˚C. Chop the rosemary very fine, the smell alone is enough to make you salivate, add some olive oil and grind even finer with a mortar and pestle. Cut the grapes in half and keep aside. Cut the dough into four pieces. Roll it out thinly and bake in a warm oven until it bubbles up here and there with a nice golden colour. Remove from the oven and lather generously with the olive oil and rosemary mixture. Sprinkle with grapes and Parmesan and drizzle with honey. Put it back in the oven until the Parmesan starts to melt.